A head gasket that is leaking can be a large issue. If for some reason you don’t want to get the head gasket replaced when this happens, you might try fixing it yourself with something called engine block sealer. This can provide you with a temporary repair for a small head gasket leak. However, if the leak is serious, you will have to get it replaced as soon as possible. Check under the filler cap for the oil. When head gaskets start leaking, one of the common symptoms is “mayonnaise” underneath this cap. It is called this because of a film that develops underneath this cap that can resemble this condiment.A creamy white buildup can indicate a head gasket leak. Remember that just because there is no buildup, that doesn’t mean that the head gasket is not leaking. Watch for white smoke coming from the exhaust. When head gaskets fail, coolant can leak into the cylinders and be burned right along with the fuel and air mixture. Burning the coolant means that the color of the exhaust will be not the normal one and can appear to be grey or white as opposed to the darker colors. As a head gasket leak gets larger, the color of the exhaust will get whiter. Drain your oil and check for coolant. When you change your oil, check the oil that comes from the vehicle for any signs of coolant. A leaky head gasket can allow coolant to get into the oil, but since the oil and the coolant are different types of substances, and have different consistencies, they will separate. If you notice any sort of light swirls in the oil, they might be from the coolant. If there is enough of the coolant for you to make out the color, it is typically pink, orange, or green. Listen and feel for misfires. When your vehicle misfires, you might feel a vibration that goes throughout the vehicle. You might notice that the RPMs shudder when this happens. The misfire and vibration might be caused by some of the coolant getting into the cylinders and then failing to ignite. 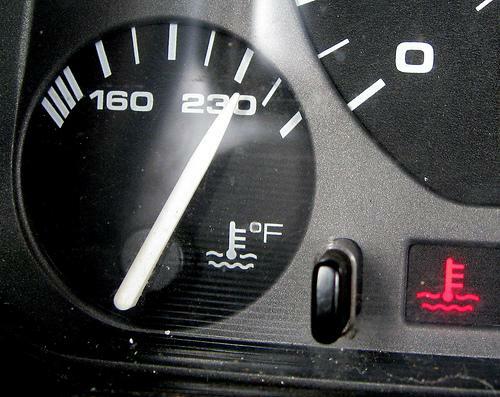 Misfires will typically result in your check engine light coming on. A leaky head gasket is only one of many reasons for your check engine light to turn on. Use your OBDII scanner or head to the nearest parts house where they can scan the vehicle for you. Only do this if the check engine light is on. When this light is on, the computer in the engine will generate a code that can be read by the scanner. It can give you clues as to what is going on with the vehicle. If the code is indicative of a misfire, one of the possible reasons might be a bad head gasket. Keep an eye on the temperature gauge. A faulty head gasket can compromise the ability of a vehicle to maintain a steady temperature. If your engine is running hot or starts overheating, that might be the result of a leaky head gasket. If your vehicle begins to overheat, you need to pull over as soon as possible. Turn the engine off. Driving a vehicle when it is overheating can significantly damage the cylinder head and the engine. A head gasket that is leaking can lead to quite a few issues with your vehicle. The largest issue of this nature can be the loss of your coolant. It doesn’t matter if the leak is internal and causing the coolant to get into the combustion chamber, or external and allowing water to get into your engine bay, this can lead to a situation with your vehicle that is actually dangerous. Low levels of coolant can lead to the engine in your car overheating, and this can cause quite a bit of damage in a small amount of time. A head gasket that leaks can also lead to issues with the motor if the coolant gets into the combustion chamber. This can foul up your spark plugs, and coolant that pools when you turn the motor off can quickly lead to corrosion and rust on the piston rings and cylinder walls, which then leads to lower compression and even to engine damage that is long term. the cost of repairs will go up swiftly and significantly. If you are able to catch a leaky head gasket early and get it replaced, you can generally just replace the gaskets and then reinstall the cylinder head as it is. On the other hand, if you decide to let the leak continue and the block or head become warped or eroded, you will need quite a bit of machine work in order to repair the head and/or block, or even to replace them. Machine work and replacement can be incredibly expensive and can easily double or even triple the cost of just replacing the head gaskets. If it turns out that you absolutely have to drive while your head gasket is leaking, the most critical thing that you can do is to keep an eye on your coolant level and the temperature gauge to ensure that your engine won’t overheat. When an engine overheats, the head gasket leak can become worse and other engine components can also be damaged. In the simplest of terms, an engine can be broken down into 2 sections. The top part of the engine is where the valves control the flow of air that goes into and out of the cylinders and where the fuel is introduced into the cylinder bank. This part is known as the head. The bottom part of your engine is quite a bit larger in terms of volume and this is where the cylinders and their pistons convert the fuel into forward motion are located. For an engine to function properly, there needs to be a seal between these sections that is airtight. The head gasket maintains that seal, but after a few years of use and wear, it can dry out, and then crack, and then fail. When it fails, the fuel, coolant, and oil, can all wind up in the wrong places and your risk of overheating grows exponentially. Paying to have a mechanic replace the head gasket with a new one can be a bit pricey and might not be worth the price if the vehicle in question is one that is worth the cost or if your budget is as tight as it can be. However, depending on how severe the issue is, you might have an alternative option or two. If you think you have a leaky head gasket, you need to evaluate the severity of it. If the engine takes less than 15 minutes running to overheat, you will more than likely need a mechanic to replace the head gasket. This can be as much as $3,000 or more. I bet you can see now how this can total a vehicle. Not every single case of a failing head gasket is guaranteed to put a dent in your wallet. If you can run your vehicle for more than 15 minutes without it overheating, there are a few chemical repair products on the market that are designed to actually seal up the leak without having to take the engine apart. In fact, you don’t even need to have a wealth of mechanical knowledge to do this yourself! Your head gasket is pressed in between the cylinder heads and the engine block in order to have an air and water tight seal. Its primary function is to seal against the combustion pressure exerted on the cylinder so that the coolant and oil can flow properly between the head and the block while not leaking into the combustion chamber itself or being able to mix with each other. 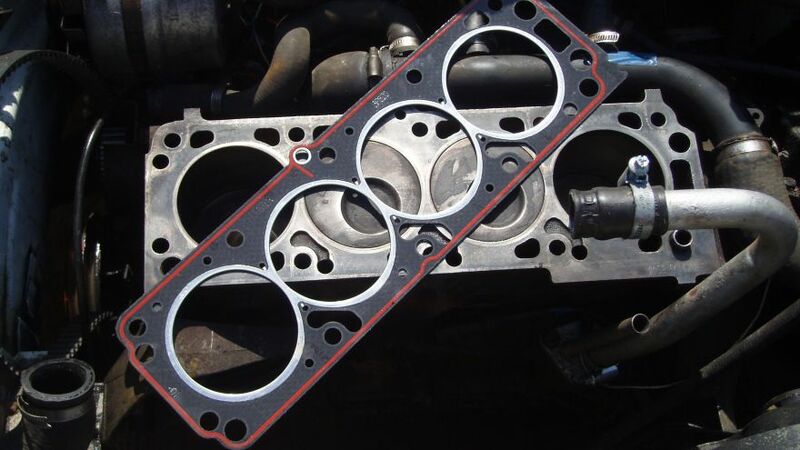 Typically, the head gasket is made from soft sheet metal and then stamped in order to surround all of the leak points with a variety of ridges. Then, it gets pressed between the block and the head with what are known as head bolts in order to create a seal that is tight. The most common reason for the head gasket to be damaged is the engine overheating. When this gasket is subjected to those types of temperatures for too long a time, the head of the cylinder can warp, releasing the pressure seal of the gasket. The gaskets themselves are rather inexpensive, but in order to replace one, the engine has to be dismantled, and this means that replacing it can be rather pricey. Go BDP– What are the Symptoms of a Blown Head Gasket?